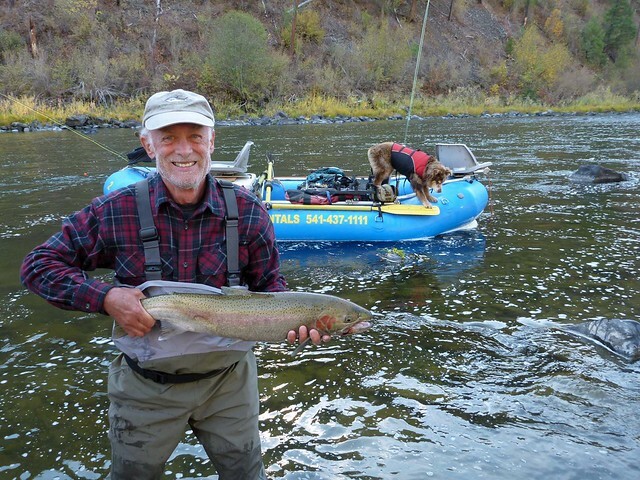 Special thanks to Jim Reichman for sharing his Northeast Oregon fishing trip with OregonFlyFishingBlog.com readers. 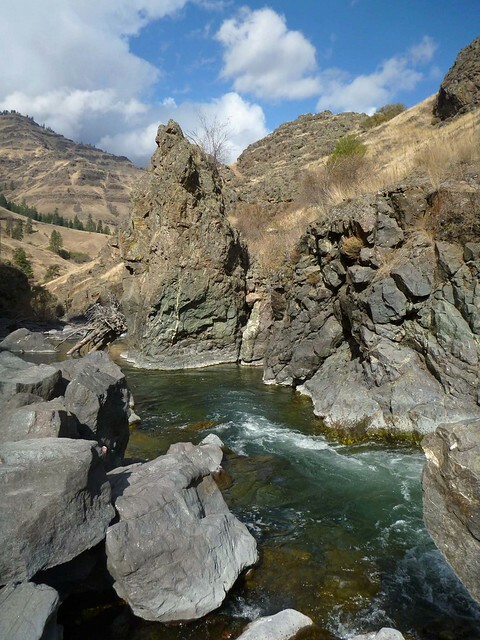 Among the many attractions of NE Oregon are the rivers and creeks that flow into the Snake River and ultimately the Columbia. After six years of imagining a fishing trip that would include the Wenaha, Wallowa, Minam, Lostine, Imnaha and Grande Ronde rivers I was able to convince fishing buddies from Eugene (Ron), Arizona (Ted), California (Mike), and Pennsylvania (Rob) to join me on the expedition. 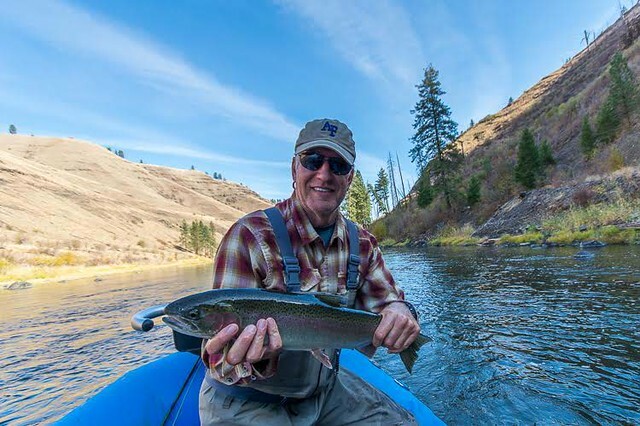 We set up the trip for mid-October, the prime time for arriving steelhead and large resident rainbows, which would include hike-ins, wading, and a float on the Grand Ronde. 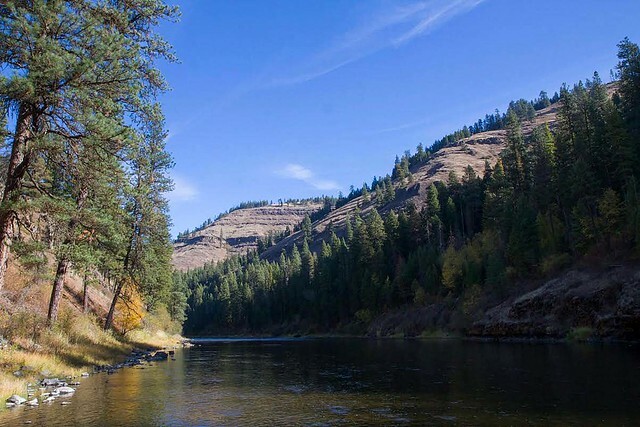 The initial objective was the Wenaha, a beautiful river that begins in Washington, flows south into Oregon before taking a hard left to the east and flowing into the Grand Ronde near Troy. 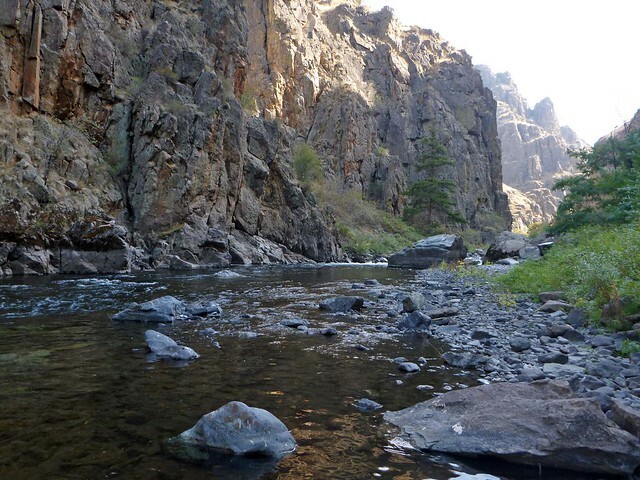 Getting to the river from the rim would involve a 5 mile round trip hike, with altitude changes of 1,700’ – 2,500’. However, about a month before we were to go in the Grizzly fire burned over 80,000 acres, including about 15 miles of the Wenaha Canyon. The road to the rim is still closed, and there is no information on the extent of the impact of the fire, which Forest Service officials believe won’t be put out until snows arrive. So, after a slight change in our itinerary, three of us drove to Minam, Oregon and took up residence in the Minam Motel, a classic 1950’s roadside motel at the confluence of the Minam and Wallowa rivers. The motel is owned and operated by Grant and Lottie Richie, the outfitters for the Grand Ronde float. We fished right at the motel and a full day on the 10 miles of public access on the Wallowa, focusing on the 2-3 miles just above the motel. We mostly used hopper/dropper rigs (e.g., Chubby Chernobyl/Copper John) and while we didn’t catch many large rainbows the fishing was fun, the scenery and weather beautiful. The next day our two other friends showed up and fished the Wallowa, with plentiful fish, including a few large rainbows. Meanwhile, three of us hiked up the Minam River which, along with all of the water in the area, was extremely low. We found very little water to fish, but the hike was great, and one could imagine, with a bit more water, the fishing would have been enjoyable. Alas, the Lostine, a small river to start with, was unfishable at these low water flows. The next day the five of us, joined by Dan from Maine, began a 4-night, 5-day float on the Grand Ronde run by Grant and his crew (http://minamraftrentals.com/guided_trips.html). The guided trips have 4-8 anglers, 2 to a raft, which are nicely set up with fishing stations on either end. 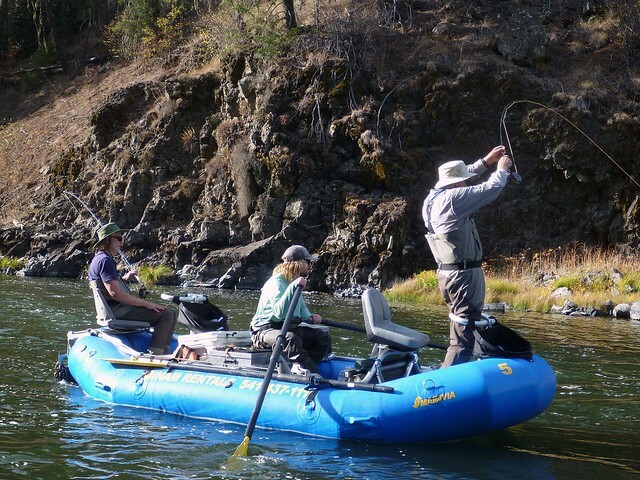 Grant also rents equipment (rafts, frames, and associated gear for a float) for those who want to do their own trip, and runs supported trips with anglers doing fishing on their own, but arriving in camp with tents up and appetizers and dinner waiting. 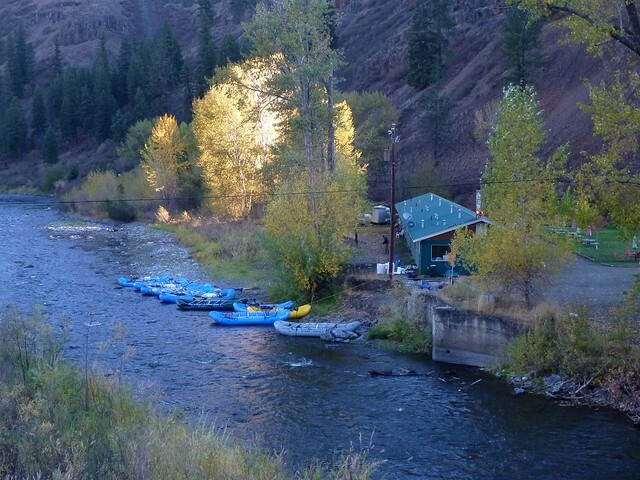 The float alone is memorable – 45 miles of roadless (no cars or trains) water. We spent most of the first day on the Wallowa, floating into the Grand Ronde after about 8 miles. The water was very low, and fishing was slow, although the last of the three fishing rafts caught 30+ fish. 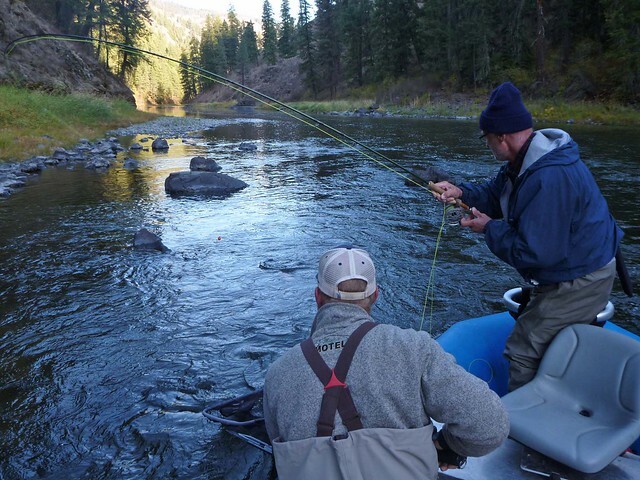 The fishing heated up on the second day, as we got into the Grand Ronde canyon, and generally got better each day, with the third and fourth day being particularly active. The fishing was diverse and almost continuous – popping flies into pocket water or dropping them in deep holes, drifting them along steep canyon walls, lobbing rigs into eddies and drawing them out across seams, and stripping streamers through slots. The fish were diverse as well – while we were targeting aggressive steelhead and big rainbows we also caught four or five other species..
On top of this the weather was sunny and warm, there was abundant wildlife (mink, otters, bighorn sheep, with black bears, mountain goats, and elk often spotted on other trips), and we had the river to ourselves. The number and nature of the fish varied by day, position, and flies. Often the lead raft got to the best holes first and had the best success, but on many occasions the following rafts would pull into the same holes and haul big fish out. At one memorable spot two rafts worked one hole, with three of the anglers landing a steelhead. I hooked one but didn’t land it, ruining the grand slam. We started out using streamers (especially black-and-white Dali Lamas) but eventually moved to two black rubber legs under an indicator (Pat’s Rubber Legs being the local fly of choice). By the last day of the trip streamers were working. We used 6 wt. – 8 wt. rods – I used a 7 wt. switch rod, which seemed ideal. The camps were very pleasant and comfortable – usually 2 people per tent (but they don’t put you in tents with people you don’t know, although being in with people you do know could be worse…). The food was quite nice, and there was a fire (in a fire pan) every evening and morning. The three guides and the two “swampers” were very capable and cordial, as were the anglers, making for a memorable, even “best ever”, trip. We pulled out, near Troy, around mid-afternoon on the 5th day. He had our car shuttled to the takeout as we were headed over to the Imnaha River. We settled in to the Imnaha River Inn (http://www.imnahariverinn.com/index.html), a very comfortable B&B five miles north of the town of Imnaha. Breakfast is provided and you can order a packed lunch and get a home cooked dinner for a bit extra. The next morning we drove from the Inn to the trail head that follows the Imnaha down to the confluence with the Snake. The road is slow going – about 1.5 hours to go 15 miles but it is not as gnarly as it is made out to be, at least when the weather is good. The trail to the confluence is about 5.5 miles, but there is fishing all along the way. We fished between 15 minutes and 50 minutes in and, using rubber legs caught 3 steelhead between us in about 2 hours of fishing. As an added benefit, the hike is beautiful (but heavily patrolled by poison oak). 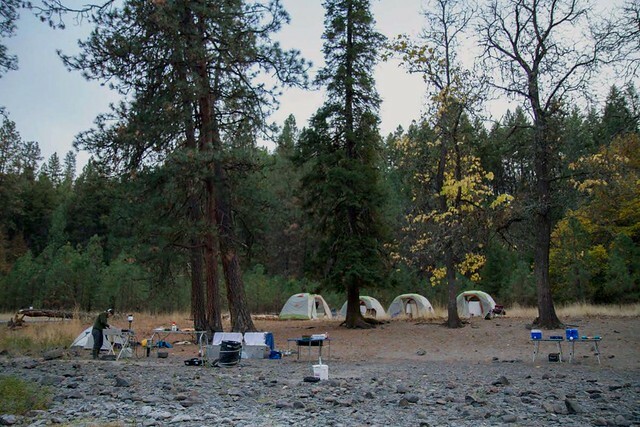 The next day we packed up and headed south, up river and out of the Imnaha basin. Because of the focus on steelhead (and a resurgent salmon run) the Imnaha is not known as a trout stream but we had a great time fishing spots along the river. Much of the land is private property, but there is public access for about 2.5 miles south of the town of Imnaha, and about 15 miles south there is a clearly marked stretch of public access and with beautiful water where we caught trout (mostly small) and a couple of bull trout (which can be targeted but must be released). Late that afternoon we drove out of the Imnaha Canyon towards Lick Creek and Joseph, headed home after 10 days of fishing. 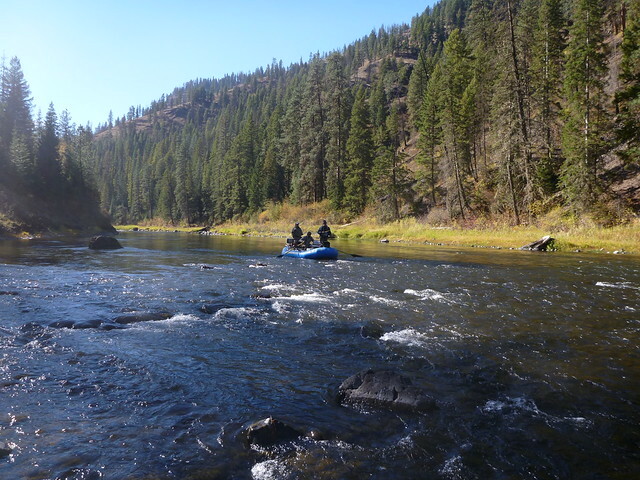 The highlights – the amazing float on the Wallowa/Grand Ronde, catching steelhead “unguided”, and really great friends.